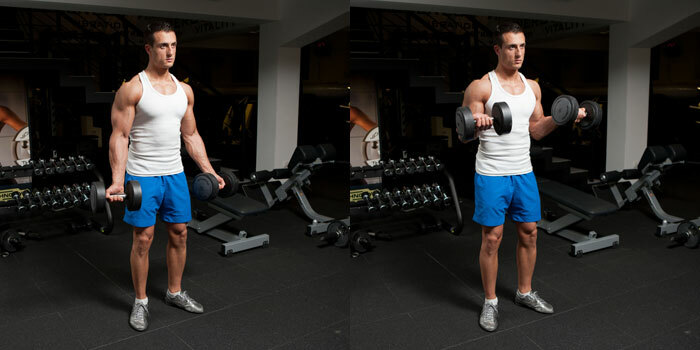 Grasp set of dumbbells and stand upright with your hand to sides and palms facing forward. Position your feet about 15-20cm. apart and keep your knees slightly flexed for a better stability during the movement. This will be your Dumbbell Biceps Curl starting position. As you keep your upper arms stationary inhale and start to curl the weights until you reach a fully contracted position. Hold for a second, squeeze your biceps and lower the weight in controlled motion back to the starting position. Keep your elbows fixed at the sides during the movement and move only your forearms.